Somehow, flying cars are still one of the last great vestiges of futurism. Come 2015, you’ll be able to buy this hoverboard. In 2017, you can pick up your very own hover bike. Then by 2020 or so, this flying car will supposedly be on the market as well. That’s how we know we’re living in the future. Flying cars. Of course, there are plenty of other signs that we’re “living in the future” already: tablet computers, instant language translation apps, drones, reality TV. But somehow, flying cars are still one of the last great vestiges of futurism. Until those and jetpacks are on the market, we haven’t quite succeeded as a society. 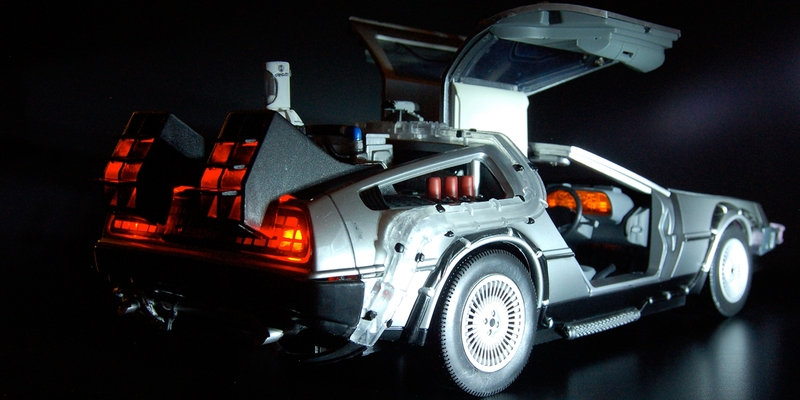 Flying cars have been a staple of sci-fi and fantasy fiction for as long as cars have existed in real life. At the tail end of the 19th century, Albert Robida was already envisioning a version of 1950s France where the skies are overtaken by personal helicopters and gondola rocketships. Flying cars are such a fixture of “the future” that they’ve become a kind of punchline: If we can have the Internet and climate change and space travel, then where’s my flying car? But the great dream has developed into something more like a meme or a romantic ideal than a serious prediction for the future. Practicality has set in. Compared to plain old earthbound cars, flying vehicles are always going to be way more expensive and dangerous, particularly if you have a bunch of them flying around at once. From Star Wars to The Fifth Element, flying traffic has always been an automatic signifier of The Future, but the closer we get to actually having those cars in real life, the more they seem like a nostalgic daydream of retrofuturism. Think of the kind of “future” we typically imagine coinciding with flying cars. It’s basically The Jetsons: a high-tech, utopian cityscape that bears an oddly close resemblance to life in mid-20th century America, plus a few technological advancements. Most recently, we saw a near-parody version of that archetype in the first Captain America movie, shown off by Iron Man’s dad, Howard Stark. “What if I told you that in just a short few years, your automobile won’t even have to touch the ground at all?” says Howard Stark at a tech expo in the 1940s, showing off a car that quite obviously fails to fly. By the 2010s, that world had the Iron Man suit, but there was still a conspicuous lack of flying cars. The one exception was Agent Coulson’s souped-up vintage Corvette, itself an accessory of its owner’s obsession with vintage Americana. Even in the heightened reality of superhero movies, flying cars seem a little cheesy—a relic of a more romantic era of science fiction. Ironically, now that we’ve reached the point where affordable hover-vehicles might actually be possible, the concept no longer gels with most people’s expectations for their future. When a YouTube video claimed to have recreated the hoverboards from Back to the Future 2, it was debunked as a hoax almost instantly. Hoverboards are a cool idea, but if you’re looking for signs of 1980s sci-fi hitting the real 21st century, you’d be better off with a cyberpunk dystopia. Thanks to Google and PRISM, we’re basically already there. Rather than assuming that in The Future, every family will have a flying car like the Jetsons, the most likely route is actually through the kind of tech company aimed squarely at super-rich people in need of new toys. The Moller Skycar, a recent prototype “flying car” (more like a miniature vertical takeoff-and-landing aircraft), was evidently modeled on the Coulson brand of retro imagery, despite the fact that it was developed in the 2000s. One poster shows the kind of art that would feel perfectly at home in a “City of Tomorrow” spread in Life magazine, circa 1960 or so. The retrofuturistic Skycar was created by Moller Industries, a company owned by a man who has been attempting to build a functioning flying car for 50 years. Paul Moller filed for bankruptcy in 2009, and the Skycar seems to be dead in the water, alongside more eccentric attempts including a flying saucer. Rich investors sunk a great deal of money into his vision, with no apparent payoff after decades of development. Terrafugia looks rather more plausible, an aircraft manufacturer whose honest-to-god slogan is “We make flying cars.” Actually, what they make is “roadable aircraft,” but it basically amounts to the same thing. This different terminology just helps to highlight the fact that you’re paying for an airplane that can also drive on roads, meaning that you need to have a pilot’s license. There is real footage of Terrafugia’s Transition aircraft in flight and on land, but it isn’t actually on sale yet. The most you can do is put down a $10,000 deposit toward an eventual purchase price of $279,000. Their actual “flying car” is the TF-X, which doesn’t even have a public prototype, although the company estimates it will be ready in eight to 12 years. The aerofex hover bike is the latest to make headlines, mostly thanks to the Star Wars connection. It’s supposed to act in a similar way to the landspeeders on Tattooine, and it’s yours for a mere $85,000 (although not until 2017). In reality, it’s a little more ungainly than anything piloted by a Skywalker. The test footage seems legit, but it’s less “landspeeder” and more “shaky wobbling 18 inches above ground.” And once again, this is an accessory for the multimillionaire who has everything, rather than something you’ll be able to get from your local car dealership anytime soon. What the world really needs is someone with the money and chutzpah to just go ahead and build a pointless but awesome flying vehicle without having to shill for investors online. Which is why Elon Musk’s casual statement that “maybe we’ll make a flying car, just for fun,” is so tempting. As an early investor in (and CEO of) SpaceX and Tesla Motors, Musk is the crossover point between science fiction and the Forbes billionaires list. He has the experience and the bank balance to make this kind of dream a reality. Somehow, despite the fact Elon Musk’s Hyperloop floating train idea is little more than a hypothetical, one wants to believe that he might one day give us that flying car. And honestly, that’s mostly because he embodies the optimistic mood of the old 20th century futurists. He’s often compared to Iron Man’s Tony Stark, he was inspired by Isaac Asimov, and he’s currently working on a submarine car—for no reason other than that he wants to build a submarine car. Unlike all those plausible but ungainly “roadable aircraft” efforts with their folding wings and slightly dodgy YouTube simulations, an Elon Musk flying car would probably look cool. It would also have the weight of his public image behind it, which would go a long way in attempting to market an idea that up until now has mostly existed in the realm of science fiction. The history of technological development is littered with inventions that were first dreamed up by sci-fi authors with no real knowledge of engineering. Star Trek is regularly name-checked as the inspiration for 3D printers and smartphones, while sites like Instructables are now full of tutorials from people who have developed ways to recreate superhero powers. So, with this many fictional images of flying cars floating around the pop-culture universe, where are its real-world examples?